Auckland's Einstein of ice cream is at it again. Forget what you know about the hot cross bun. Auckland's very own 'Einstein of ice cream', Gianpaolo Grazioli, has gone and flipped the traditional sweet and spicy bun on its head — or rather impaled it with a waffle cone and filled it with ice cream. 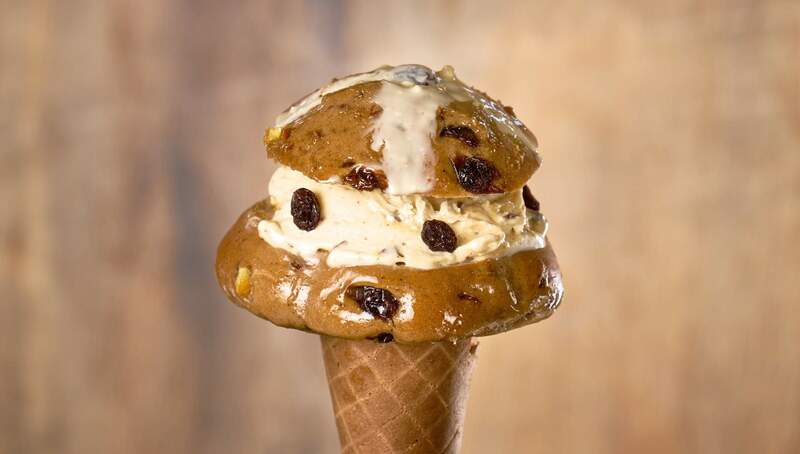 Part cone, part bun — which is served warm — the Hot Cross Bun Cone arrives just in time for Easter. It's not the first time the inner-city ice cream joint has thrown the rulebook completely out the window. Giapo has an entire 'discombobulating' menu dedicated to the most unlikely of unlikely food pairings — including ice cream arancini, gyoza and poutine. To make the spicy hot cross bun creation Giapo soaked raisins in orange juice to stay nice and moist in the bun after baking. The spices are a glorious blend of cinnamon, cloves and mixed spice, and topping it off is the unmistakable aroma of candied orange peel. The bun is then sliced in half with the bottom section sitting perfectly around the top of a waffle cone. The bottom half is filled with ice cream of the customer's choice with the lid of the bun smushed on top. The Hot Cross Bun Cone is available at Giapo from now until further notice. Find Giapo at 12 Gore Street, CBD.